WSK Series Wobble Socket Adapter Kit enables any fastener tool withÂ 3/8, Â½, 5/8, Â¾, or 1 in.Â female square drive andÂ DIN groove to be converted into Wobble socket. This will enable user to drive fasteners that may have misalignment of up to 10Â° between drive tool axis and fastener axis. Additional benefits include extending tool life, helping take care of clearance issues when driving fastener tools, and transfering complete torque to fastener. Dayton, OH – Apex Fastener Tools, the global leader in industrial fastener tools, has announced the launch of the WSK Series Wobble Socket Adapter Kit. 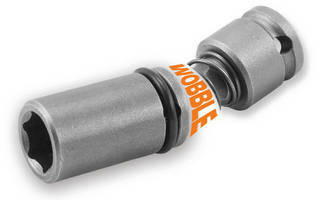 This innovative product will let a user convert any fastener tool with a female square drive (3/8”, 1/2”, 5/8”, 3/4”, or 1”) and a DIN groove into a Wobble socket. “Apex takes immense pride in listening to our customers and solving their problems. The WSK Socket Kit can improve a customer’s tool life, help take care of clearance issues when driving fastener tools, transfer complete torque to the fastener, and provide the user the flexibility to use the WSK adapter with multiple sized sockets.” added Vipul Agarwal, Global Product Manager, Apex Fastener Tools. Apex® Fastener Tools is a business unit of Apex Tool Group, LLC (www.ApexToolGroup.com). For over 80 years Apex has maintained a position of leadership in industrial fastener tools and has been THE trusted name for the most demanding industrial applications. As the leading innovator in industrial bits, sockets, and universal wrenches, Apex products can be found in the most challenging production environments. Apex Tool Group (ATG) is one of the largest manufacturers of professional hand and power tools in the world, serving the industrial, vehicle service and assembly, aerospace, electronics, construction and serious DIY markets. Our portfolio of over 30 innovative brands includes many category leaders, such as Apex®, Dotco®, Quackenbush®, Recoules®, SATA®, GearWrench®, Weller®, Wiss®, Lufkin®, Cleco® and Crescent®. ATG also manufactures select, premier private label mechanics tools. Across the board, our tools stand for quality, innovation and value. Known for solving seemingly impossible problems, they are intuitive and simple to use, yet indispensable. ATG works collaboratively with distributors, retailers and large customers across the globe to make sure end users have the tools they need to solve real-world problems.